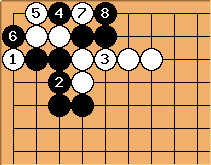 For reference, the problem here obviously is that the two white stones have only 3 liberties, while the black have 4. If White plainly reduces them, Black wins the race. 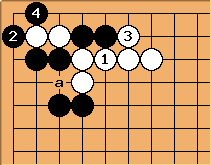 White must use the weakness at a and the special properties of the corner, also known as strange things happen at the 1-2 point. is a common way (one might say tesuji) to increase liberties in a fight in the corner. First, it increases the liberties of the chain itself from 3 to 4. More importantly, creates an approach liberty at a which Black must fill if he wants to eat the liberties on that line, which he won't do, because a is an inside liberty. and create another such liberty at b. 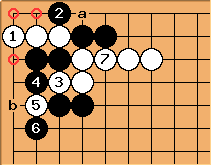 If Black wants to start from this side, he must play b first to avoid auto-atari. So, the circled liberties and b add to 4 liberties, then reduces Black to 3. If Black patches the weakness, wins the capturing race. 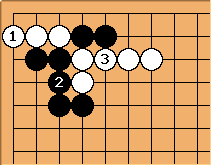 here is a crude way to use the Black weakness. The result is a ko.